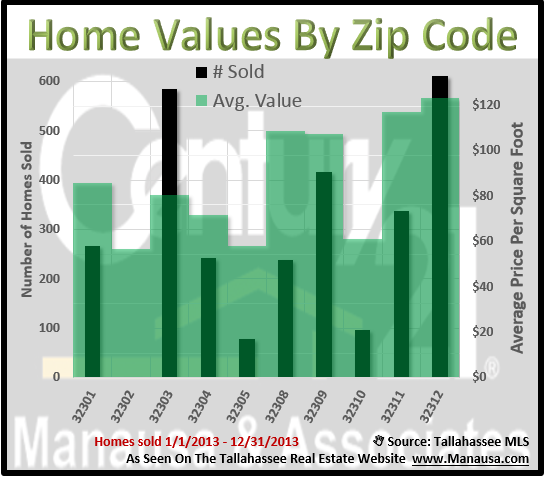 If you are starting the process of buying a home in Tallahassee, you are probably curious about the type and value of houses you will find across the many Tallahassee zip codes. We have received a lot of positive feedback about our report on the most popular neighborhoods in Tallahassee, there we have decided to follow it up with a similar report on zip codes. 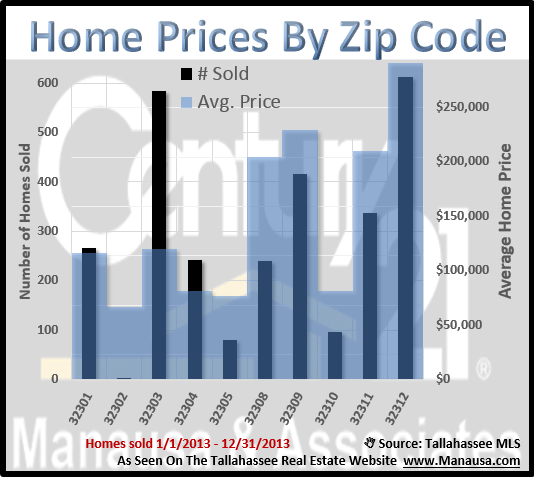 We have included three graphs that show average home prices, average home values, and average home sizes for the ten most active zip codes in the Tallahassee real estate market. Our first real estate graph provides a great glimpse into what you will have to spend to live in each zip code in Tallahassee. In each of the three graphs included in our blog post, the number of closed sales from 2013 is shown as black bars, measured on the left vertical axis. The focal measurement (average home prices shown in blue in the graph above) is shown as shaded columns and measured on the right vertical axis. Average home prices are the highest in 32312 ($290,107) and lowest in 32302 ($66,500), though only one home sale was reported in 32302 in the Tallahassee MLS in 2013. Average home values by Tallahassee zip code range from $57 per square foot in 32302, all the way up to $123 per square foot in the 32312 zip code. The most homogeneous zip codes (where the values are fairly consistent across all neighborhoods) can be found in 32308 and 32309. The converse is true for 32301 and 32303, where values range significantly across the different neighborhoods and condominium units in their areas. 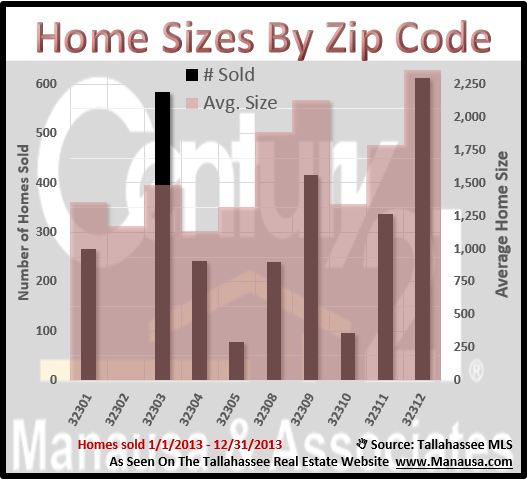 Finally, if you want to know how big the homes are in the Tallahassee real estate market, the following graph shows what you will find across the ten most active zip codes. The largest homes can be found in the 32312 zip code, where they average 2,360 square feet. The 32304 zip code reports the smallest average home size of 1,136, while the overall Tallahassee real estate market averages show a 1,792 square foot home worth $103 per square foot for an average home price of $185,137. If you want to know more about buying a home in any of the Tallahassee zip codes, just drop me a note and we can schedule a time to start the fund and exciting process right away. Joe, we are planning to relocate to Florida. We were interested on a home near a beach on the Gulf or Atlantic, but I was told and have read that that home Insurance is very expensive to as much as $7,ooo per year or more. I was told that the same size home inland would be about $650-750 per year. I am concerned about the insurance and purchasing a home in a High risk area for sink holes and flooding. How should we deal with these concerns? Jimmy, I would pick a location or two where you have an interest in moving. Then I would address these issues with a realtor at that location. Your specific location and price range will impact what you pay per month.